Mouse monoclonal BRCA1 antibody [MS110]. Validated in IP, IHC, Flow Cyt, ICC/IF and tested in Human. Cited in 36 publication(s). Independently reviewed in 13 review(s). Within the N-terminal 304 amino acids of BRCA1. IHC-P: Human breast carcinoma tissue. Human skin tissue. ICC/IF: MCF7 and A431 cells. Human ovarian tumor cells. Human colon cancer cells. Flow cytometry: MCF7 cells. 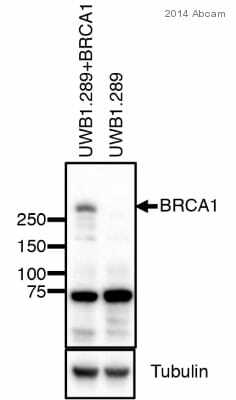 Please note that this antibody is not suitable for WB. Despite positive publications and Abreviews we have mixed feedback on this antibody in WB and we do not guarantee ab16780 for WB. Our Abpromise guarantee covers the use of ab16780 in the following tested applications. E3 ubiquitin-protein ligase that specifically mediates the formation of 'Lys-6'-linked polyubiquitin chains and plays a central role in DNA repair by facilitating cellular responses to DNA damage. It is unclear whether it also mediates the formation of other types of polyubiquitin chains. The E3 ubiquitin-protein ligase activity is required for its tumor suppressor function. The BRCA1-BARD1 heterodimer coordinates a diverse range of cellular pathways such as DNA damage repair, ubiquitination and transcriptional regulation to maintain genomic stability. Regulates centrosomal microtubule nucleation. Required for normal cell cycle progression from G2 to mitosis. Required for appropriate cell cycle arrests after ionizing irradiation in both the S-phase and the G2 phase of the cell cycle. Involved in transcriptional regulation of P21 in response to DNA damage. Required for FANCD2 targeting to sites of DNA damage. May function as a transcriptional regulator. Inhibits lipid synthesis by binding to inactive phosphorylated ACACA and preventing its dephosphorylation. Contributes to homologous recombination repair (HRR) via its direct interaction with PALB2, fine-tunes recombinational repair partly through its modulatory role in the PALB2-dependent loading of BRCA2-RAD51 repair machinery at DNA breaks. Isoform 1 and isoform 3 are widely expressed. Isoform 3 is reduced or absent in several breast and ovarian cancer cell lines. Defects in BRCA1 are a cause of susceptibility to breast cancer (BC) [MIM:114480]. A common malignancy originating from breast epithelial tissue. Breast neoplasms can be distinguished by their histologic pattern. Invasive ductal carcinoma is by far the most common type. Breast cancer is etiologically and genetically heterogeneous. Important genetic factors have been indicated by familial occurrence and bilateral involvement. Mutations at more than one locus can be involved in different families or even in the same case. Note=Mutations in BRCA1 are thought to be responsible for 45% of inherited breast cancer. Moreover, BRCA1 carriers have a 4-fold increased risk of colon cancer, whereas male carriers face a 3-fold increased risk of prostate cancer. 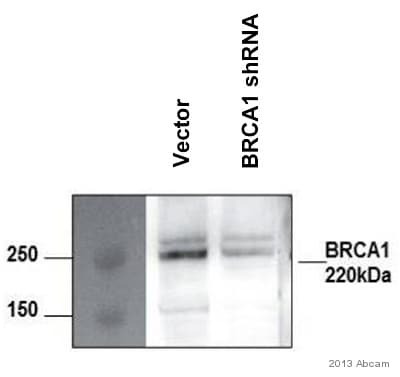 Cells lacking BRCA1 show defects in DNA repair by homologous recombination. Defects in BRCA1 are a cause of susceptibility to breast-ovarian cancer familial type 1 (BROVCA1) [MIM:604370]. A condition associated with familial predisposition to cancer of the breast and ovaries. Characteristic features in affected families are an early age of onset of breast cancer (often before age 50), increased chance of bilateral cancers (cancer that develop in both breasts, or both ovaries, independently), frequent occurrence of breast cancer among men, increased incidence of tumors of other specific organs, such as the prostate. Note=Mutations in BRCA1 are thought to be responsible for more than 80% of inherited breast-ovarian cancer. Defects in BRCA1 are a cause of genetic susceptibility to ovarian cancer [MIM:113705]. The BRCT domains recognize and bind phosphorylated pSXXF motif on proteins. The interaction with the phosphorylated pSXXF motif of FAM175A/Abraxas, recruits BRCA1 at DNA damage sites. The RING-type zinc finger domain interacts with BAP1. Phosphorylation at Ser-308 by STK6/AURKA is required for normal cell cycle progression from G2 to mitosis. Phosphorylated in response to IR, UV, and various stimuli that cause checkpoint activation, probably by ATM or ATR. Autoubiquitinated, undergoes 'Lys-6'-linked polyubiquitination. 'Lys-6'-linked polyubiquitination does not promote degradation. Cytoplasm; Nucleus. Localizes at sites of DNA damage at double-strand breaks (DSBs) and recruitment to DNA damage sites is mediated by the BRCA1-A complex. IHC image of ab16780 staining in normal human breast formalin fixed paraffin embedded tissue section, performed on a Leica BondTM system using the standard protocol F. The section was pre-treated using heat mediated antigen retrieval with sodium citrate buffer (pH6, epitope retrieval solution 1) for 20 mins. The section was then incubated with ab16780, 1µg/ml, for 15 mins at room temperature and detected using an HRP conjugated compact polymer system. DAB was used as the chromogen. The section was then counterstained with haematoxylin and mounted with DPX. IHC image of ab16780 staining in human breast carcinoma formalin fixed paraffin embedded tissue section, performed on a Leica BondTM system using the standard protocol F. The section was pre-treated using heat mediated antigen retrieval with sodium citrate buffer (pH6, epitope retrieval solution 1) for 20 mins. The section was then incubated with ab16780, 5µg/ml, for 15 mins at room temperature and detected using an HRP conjugated compact polymer system. DAB was used as the chromogen. The section was then counterstained with haematoxylin and mounted with DPX. Immunohistochemistry (Formalin/PFA-fixed paraffin-embedded sections) - Anti-BRCA1 antibody [MS110] (ab16780)This image is courtesy of an Anonymous Abreview. ab16780 staining BRCA1 in human skin tissue by Immunohistochemistry (Formalin/PFA-fixed paraffin-embedded tissue sections). The sections were fixed in formaldehyde and subjected to heat-mediated antigen retrieval in citrate buffer (pH 6.0) prior to blocking with 2% BSA for 1 hour at 22°C. The primary antibody was diluted 1/50 and incubated with the sample for 20 hours at 4°C. A biotin-conjugated goat anti-mouse polyclonal was used as the secondary antibody, diluted 1/800. 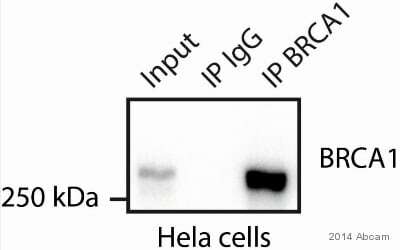 Antibody was detected by DAB staining. ICC/IF image of ab16780 stained MCF7cells. The cells were 4% PFA fixed (10 minutes) and then incubated in 1%BSA / 10% normal goat serum / 0.3M glycine in 0.1% PBS-Tween for 1 hour to permeabilize the cells and block non-specific protein-protein interactions. The cells were then incubated with the antibody (ab16780, 5 µg/ml) overnight at +4°C. The secondary antibody (green) was DyLight® 488 goat anti-mouse IgG - H&L, pre-adsorbed (ab96879) used at a 1/250 dilution for 1 hour. Alexa Fluor® 594 WGA was used to label plasma membranes (red) at a 1/200 dilution for 1 hour. DAPI was used to stain the cell nuclei (blue) at a concentration of 1.43 µM. ab16780 staining BRAC1 in human ovarian tumor cells by ICC/IF (Immunocytochemistry/immunofluorescence). Cells were fixed with paraformaldehyde, permeabilized with Acetone:Methanol and blocked with a protein block, serum-free for 1 hour at 18°C. Samples were incubated with primary antibody (1/100) for 14 hours at 4°C. An Alexa Fluor® 488-conjugated Rabbit anti-mouse IgG (H+L) polyclonal (1/400) was used as the secondary antibody. ab16780 staining BRAC1 in human colon cancer cells by ICC/IF (Immunocytochemistry/immunofluorescence). Cells were fixed with paraformaldehyde, permeabilized with 0.3% Triton X-100 and blocked with 3% BSA for 30 minutes at 4°C. Samples were incubated with primary antibody (1/200) for 12 hours at 4°C. An Alexa Fluor® 488-conjugated Goat anti-mouse IgG (H+L) polyclonal (1/1000) was used as the secondary antibody. ab16780 staining BRCA1 in human A431 epidermoid cancer cells by ICC/IF (immunocytochemistry/immunofluorescence). Cells were formaldehyde fixed, permeabilized by Triton X-100 and blocked 5% BSA for 30 minutes at room temperature. The sample was incubated with the primary antibody (1/50 in BSA) for 1 hour. An Alexa Fluor 488®-conjugated Goat anti-mouse polyclonal (1/50) was used as the secondary. Overlay histogram showing MCF7 cells stained with ab16780 (red line). The cells were fixed with 80% methanol (5 minutes) and then permeabilized with 0.1% PBS-Tween for 20 minutes. The cells were then incubated in 1x PBS / 10% normal goat serum / 0.3M glycine to block non-specific protein-protein interactions followed by the antibody (ab16780, 1 µg/1x106 cells) for 30 minutes at 22ºC. The secondary antibody used was DyLight® 488 goat anti-mouse IgG (H+L) (ab96879) at 1/500 dilution for 30 minutes at 22ºC. Isotype control antibody (black line) was mouse IgG1 [ICIGG1] (ab91353, 2 µg/1x106 cells) used under the same conditions. Acquisition of >5,000 events was performed. This antibody gave a positive signal in MCF7 cells fixed with 4% paraformaldehyde (10 minutes)/permeabilized with 0.1% PBS-Tween for 20 minutes used under the same conditions. Publishing research using ab16780? Please let us know so that we can cite the reference in this datasheet.